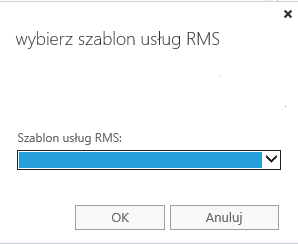 If you are trying to set your AD-RMS integration with Exchange, after followin all of the required steps to install and turn on AD-RMS, you probably will need to create transport rule in order to automatically secure e-mails. If everyting is OK, then you should see default template "Do not forward" and others already configured with AD RMS. As you see there is no template in this configuration and local SQL server is not accessible. You should check if internal SQL database or SQL server (depends on your config) is accessible. In my test environment, MSSQL$MICROSOFT##WID service was down. After starting it, RMS templates shown up. And now, I was able to create RMS rule in the transport rules with RMS template. The value for LegacyDN must be unique to each user. ITTIPS.eu. Simple theme. Powered by Blogger.